Where do you need to get to? When things change, will your plan still work? How much income will you have and where will it come from? What will your business look like 3 years from today? Are you using the Entrepreneurial Time System? What are your biggest threats & opportunities? You are probably here because someone referred you to us. Our website is here to give you an introduction to what we do. Too often financial advisors just sell products. Professional financial advice starts with a financial planning process, then advises on areas that are lacking and provides a solution. 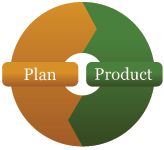 The solution will then include wealth management and insurance products, but the plan comes first. With 4 decades of experience, ongoing professional development and continuing education, independent access to a multitude of financial tools and a fully qualified staff, we are well positioned to assist our clients in meeting all of their financial needs.